Meet my right indexfinger! And there's a sight I don't like seeing at all, I'm not sure what I did but my nail got folded so to say, making it very weak and I know it wouldn't take long before it would tear off. You can use patches on these kind of things, but if your nail has a tear, you could even help it grow out with a patch, without having it tear off completely. 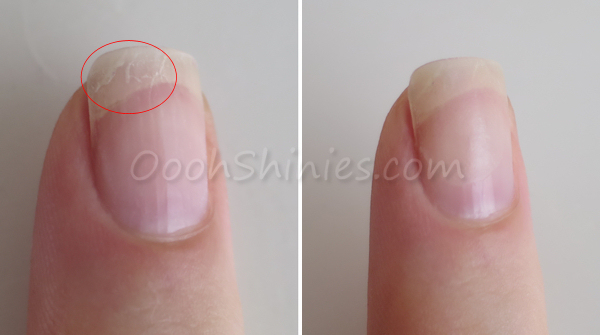 The right picture shows the patched nail. Nail wraps or an empty tea bag *not shown*. I've ordered these strips of wraps online years ago and I can't fully remember, but I think it was the cheapest silk strip shown here. 1) Use the remover and cotton pads to fully clean and dry your nail, and cut your tea bag or wrap to the preferred size. I think the pyramid tea bags work better than the regular ones, they seem to have a different structure and feel more like nail wraps to me. But the wraps have an advantage over teabags, they're a bit sticky already, which makes the rest of the process easier! I usually cut them smaller than the size of my nail, to prevent glue on my cuticles or making the filing harder near that area. 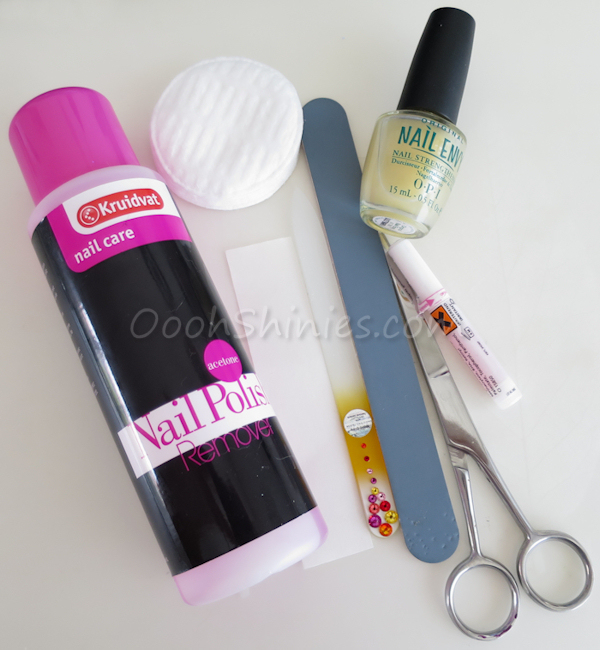 2) Stick the wrap or teabag to your nail. 4) You can see when the glue starts to dry, the structure of the wrap is showing again. 5) Filing time! Gently file till you have a fairly smooth result, and no hard bits and pieces sticking out. I use a coarser file for the first bit, then smooth it with a buffer file. Don't file too much though, the goal is to smoothen it a little, not to file the whole thing off! 6) Apply a basecoat, or for an extra smooth result, a ridgefiller. Done! To remove your wrap, either soak it with some remover with acetone, or gently file it down some more. If you're wearing polish on top of your patched nail and want to remove it, just be quick about it and the patch should stay in place. And I haven't tried it, but I suspect remover without acetone could help as well with making your patch last. If you went with the simplified version with basecoat only, the removal is of course easypeasy! Hope this helps, thanks for looking!